How do I find out more about gifts from Life Soul Vision? Our main gifts are in our store online. 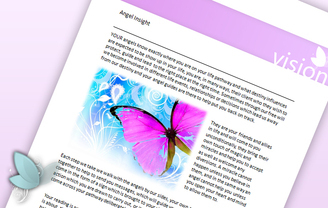 We offer a range personalised e-mail readings. We also offer 1-1 telephone guidance. Please contact us if you feel there is anything you would like to see us offer or if you have a specific question regarding an of our products or services. If I buy an email guidance gift what can I expect? If you purchase one of our unique E-Mail Readings you will receive your personal gift within 72 hours of us receiving your order. All our readings are sent electronically and in PDF format. Readings are a beautiful presentation of images and guided inspiration which we receive by connecting to your energy and your guides. Each reading is unique and tailored to your specific question or the area you are seeking guidance. We ask that you advise us at the time of order the specific area you are interested in and we will contact you directly for any further clarification. Can I order more than one email gift for myself? Yes, each email reading is created personally for you. An overview of the different types of readings can be found at our Gift Store. What sort of areas of advice does a telephone consultation cover? Usual areas of guidance relate to relationships, love and career or because you have reached a time of indecision and you are seeking spiritual direction. How are payments made to Life Soul Vision? Payments are made via Pay Pal through our Gift Shop. Pay Pal accepts all major credit and debit cards. Any and all Content, Service(s) and information is provided as entertainment services only and do not in any way constitute legal, financial, medical or any sort of professional counselling. Please seek professional advice for medical and legal help should it be necessary. The content of the Services and the use of this Website are merely for reference purposes and must not substitute professional counselling of the abovementioned kind. We at Life Soul Vision, will not pass on any information regarding readings or details provided by customers to our website nor will we give access to any information to third parties.